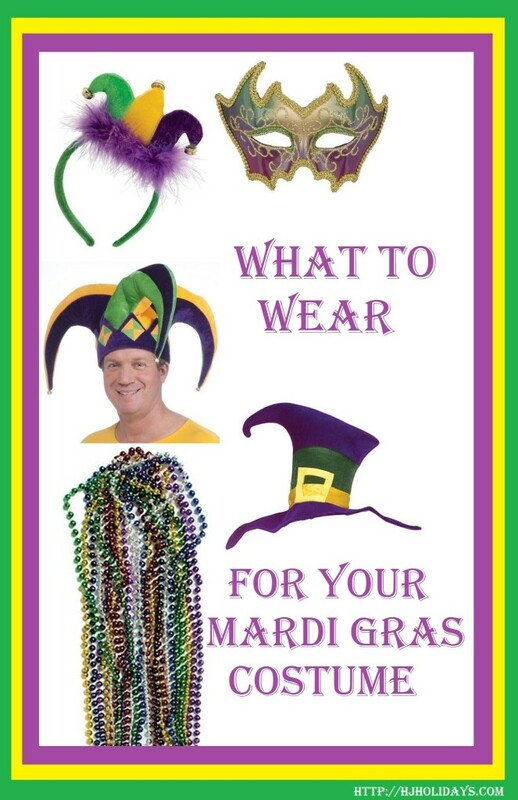 Mardi Gras is a cultural day of celebration that occurs prior to the fasting of Lent. It takes place the day before Ash Wednesday and 47 days before Easter Sunday. People celebrate Mardi Gras, also known as Fat Tuesday, by attending parties or participating in parades. 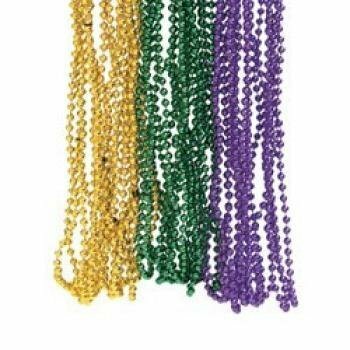 Costumes, beads, and masks are part of the celebration, with colors being gold, purple, and green. These colors stand for power, justice, and faith. 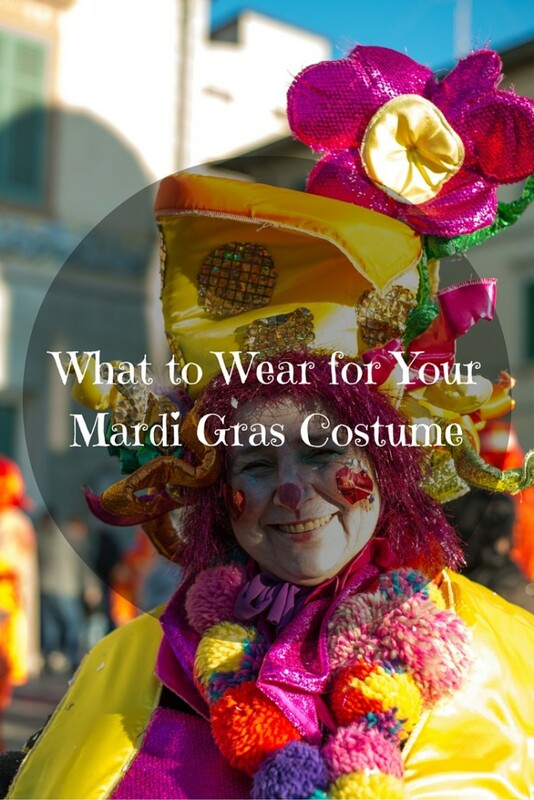 If you are not sure what to wear for your Mardi Gras costume, here are some terrific Mardi Gras costume ideas for the upcoming festivities. 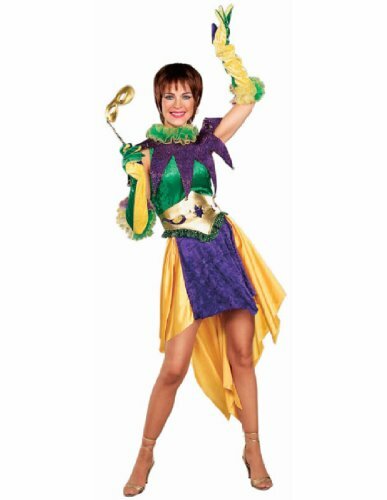 This is a one size fits most costume that is perfect for Mardi Gras or for any 1920’s style event. Dress has alternating rows of green, purple, and gold fringe and comes with a cute gold colored headpiece. Dress is sleeveless and falls a few inches above the knees. 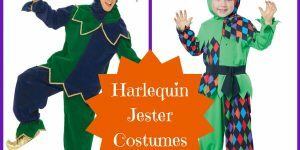 This is a one size fits most men’s costume made from 100% Polyester fabric. May be hand washed and dried flat. Costume has long pants with green, purple, and gold stripes, while shirt and vest front are multi-colored, with various sections being either green, gold, or purple. Has an attached striped bow tie in gold, green, and purple. Includes top hat in green, gold, and purple, with flower print design. This men’s vest comes in a men’s standard size that fits most. Vest includes the green, gold, and purple colors, with additional colors. Print on vest is of various Mardi Gras masks and vest is trimmed in a solid gold color. Includes a colorful bow tie with matching, colorful print. Garment is hand washable. This cute costume comes in a women’s standard size that typically fits sizes 6 through 12. Dress, collar, gloves, and belt are included. 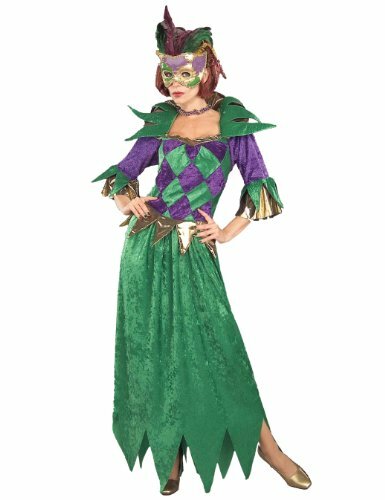 Bodice of dress is sleeveless and green in color, with a purple jester style collar with green and gold frill around the neckline. Costume has very detailed gold belt with carved out designs and shiny green trim. Skirt is short in front with a purple panel of fabric, while rest of skirt is gold in color and longer, coming to a pointed “V”shape in the back. Long gloves are half green and half gold, with purple thumbs. Gloves come to the elbows and have a lacy green, gold, and purple ruffle at the top. 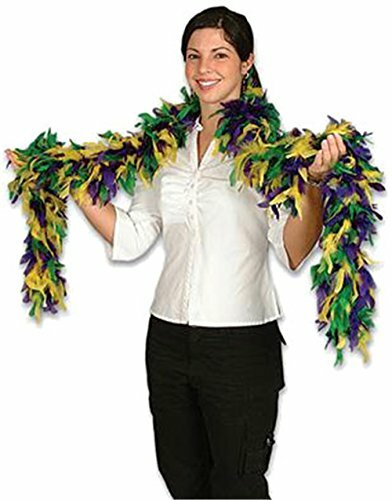 This is a long purple, green, and gold colored feather boa that may be used by either a child or adult. 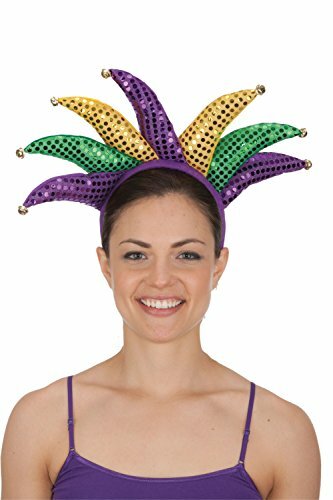 Makes a great Mardi Gras costume accessory, or could be worn alone as a stand out Mardi Gras accent piece. 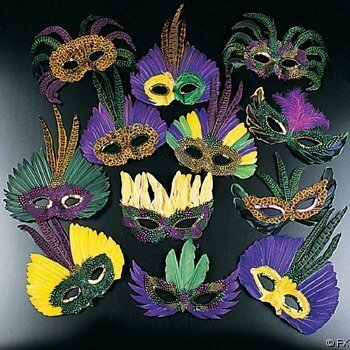 This is an assortment of great masks for Mardi Gras or other costumed fun. Each mask is different, and all feature the classic purple, gold, and green colors. The masks are made from plastic, making them more durable than paper varieties. Can be worn by either men or women. This is a headband for either men or women. Headband is a one size fits most. 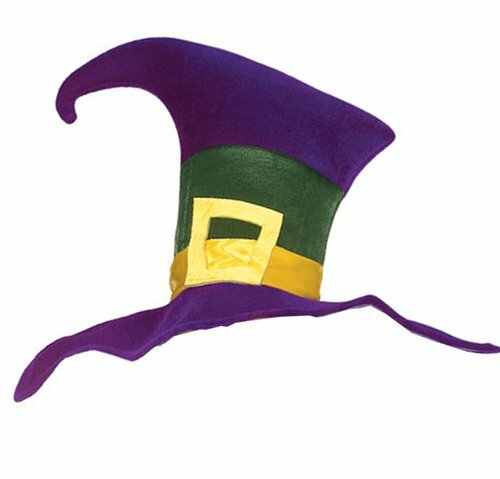 Wrapped in purple, green and yellow fabric, the headband features green, gold, and purple sequined sections of a jester style hat. Each of the three hat sections has a silver bell on the end. A great little accessory, or wear as a costume in itself. One size fits most adults. This is a 100% Polyester cape that can be hand washed. 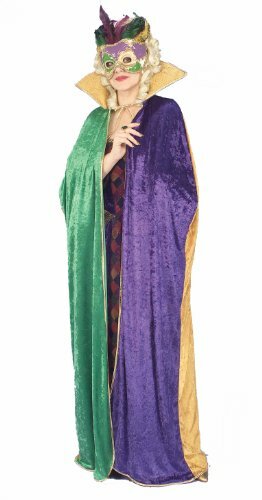 Long cape features the traditional purple, gold, and green colors of Mardi Gras. Hangs to floor length for a person of average height, and features a wide, high collar in gold. Cape has long sections of color, with one third being purple, one third green, and one third gold. Trimmed with gold piping. Combine with a feathered mask for a great look. Oversized Hurricane hat provides a festive and fun look. Comes in one size fits most, and is 100% Polyester. May be hand washed. Hat has bright purple brim, yellow band, green band, with the top of the hat being purple. Large gold “buckle” is centered in front of hat. Each set of beads is 33 inches long, consisting of beads that are 7mm thick. Bead necklaces come in the colors green, gold, purple. 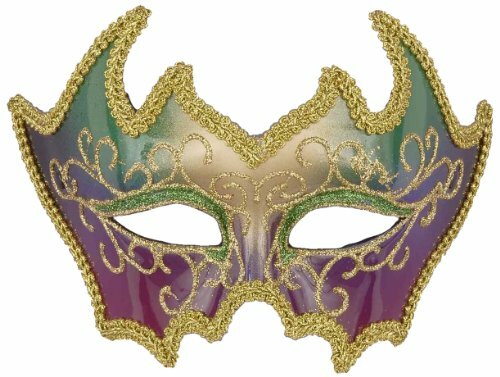 A beautiful Venetian style half mask featuring the gold, purple, and green shades of Mardi Gras. Made from 100% Polyester. Accented with gold braid and glitter. 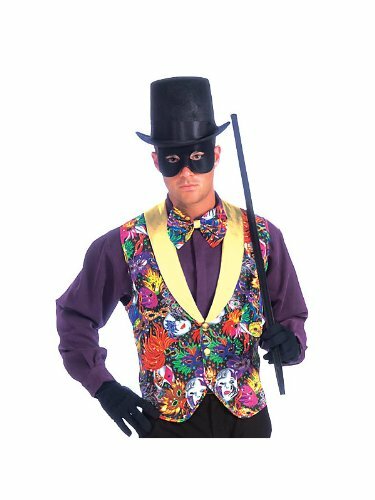 Also perfect for any other type of masquerade event. In history, these masks were worn during carnival and allowed people of all social classes to interact with each other, something that would have been frowned upon in everyday life. This is a 100% Polyester hat that fits most adults. 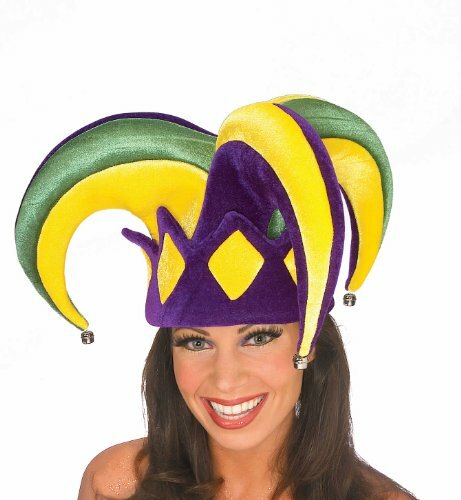 Plush jester hat has three sections, with two featuring purple and gold, and one section featuring purple and green colors. Diamond shaped designs accent the border of the hat. Bells hang from the bottom of each of the three sections.